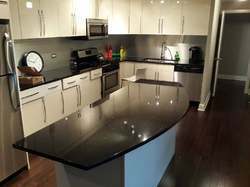 - Granite Mart lends itself to a variety of locations in traditional and modern houses for hallways, stairways, living areas, bathrooms and particularly, work surfaces such as kitchen tops and vanity tops. 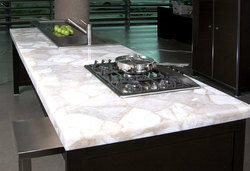 We make Kitchen tops also in Marbles, Granites and Corian Material on the basis of customer orders. Modular Kitchen components is an option for those wanting a unique contemporary look for their kitchen remodel or newly built custom kitchens. We love the clean, simple lines of these kitchen components. Our customers can avail from us an excellent quality Korian Kitchen Tops.